The contemporary Thai-Style Air-Con Family Bungalows are set among the other bungalows with the same peaceful luxury, but with an additional large single bed. Each bungalow has also its own private balcony with a hammock, western-standard bathroom with hot shower, TV, refrigerator and remote controlled air-con. Furnishings and fittings are handmade from traditional local materials on the island. 35m2 including balcony. The official check-out time is 11am and check-in starts from 2pm. You can safely store your baggage for free at the reception if you depart later in the day. Late check out until 2pm is possible upon availability for 50% of the current night rate. If cancelled or modified within 30 days prior to arrival, no refund will be granted. There is a maximum of 1 child per room allowed. 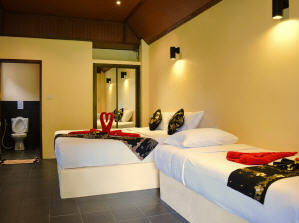 Any child up to and including 1 year old stays for 100 THB/person/night when using a crib available. 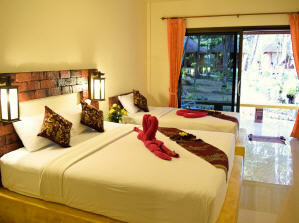 Any child up to and including 3 years old stays for 100 THB/person/night when using an existing bed.